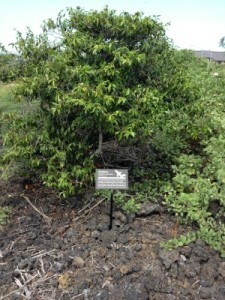 HFI is working with the Hawai‘i Forest Industry Association, the Department of Hawaiian Home Lands(DHHL), and other community partners to manage the 70-acre endangered plant preserves at the Villages of La‘i‘Ōpua in Kealakehe, North Kona, on Hawai‘i Island, where some of the rarest endangered plants in the world are being protected and perpetuated. 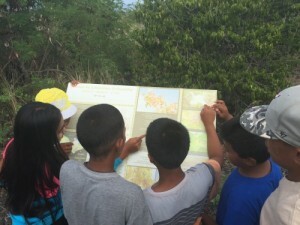 Not only does this project accomplish site restoration and management, it also provides the West Hawai‘i community with cultural and environmental education. 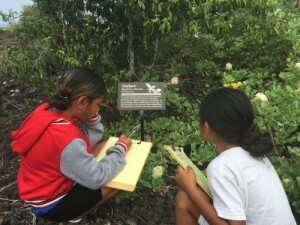 The program instills in the homesteaders at La‘i‘Ōpua a sense of their historic and cultural landscape, and helps them understand how caring for their environment is similar to taking care of their ‘ohana. 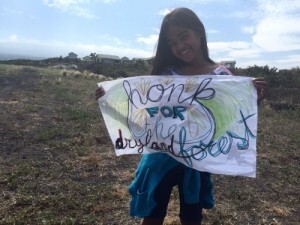 Values of aloha, mālama ‘āina, pono, and lōkahi are essential components of this project, which involves taking care of the land, water, air, and each other in spiritual harmony and creates opportunities for healthy lifestyles, both mentally and physically. 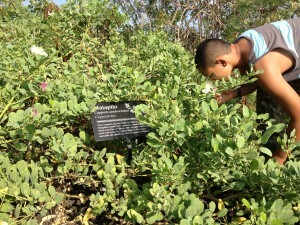 Within the La‘i‘Ōpua Dryland Habitat Preserve, The Hui Lā‘au Kama‘āina Team created the Hui Lā‘au Kama‘āina Outdoor Learning Center, a demonstration of native dryland plants along a walking trail. The walking trail is integrated with the natural landscape, offering views of the ocean and connections to the wind and sun. 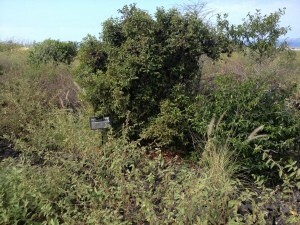 Interpretive signage and plant ID signs along the walking trail provide information about the project, history of the place, and the native plants. Protect and enhance the endangered dryland habitat. Instill in the homesteaders at La‘i‘Ōpua a sense of their historic and cultural landscape. Provide opportunities to take care of the land, water, air, and each other, displaying the values of aloha, mālama ‘āina, pono, and lōkahi. La‘i‘Ōpua Piko Trail before Mar. 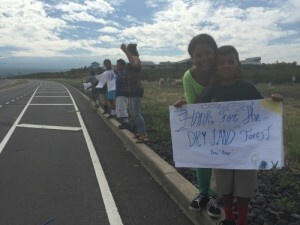 2015 Hana ‘Āina maintenance day. Piko Trail after Mar. 2015 maintenance day. Apr. 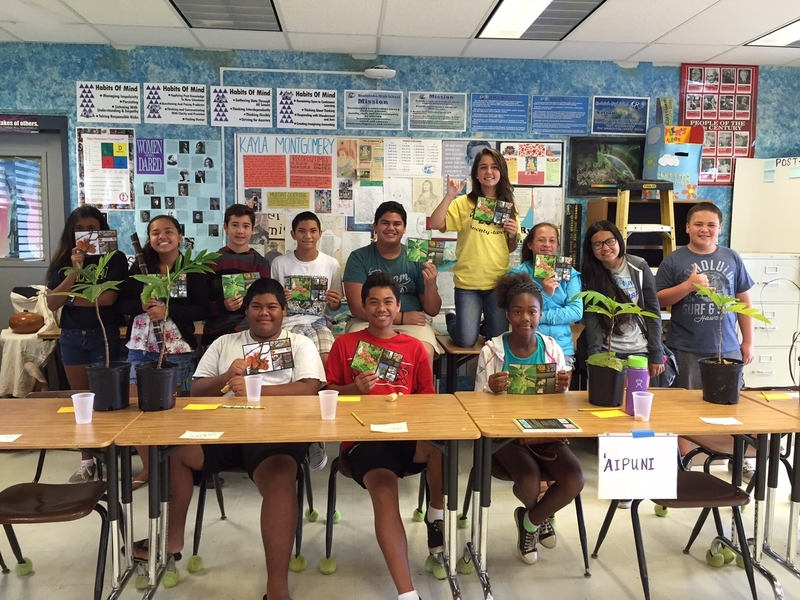 2015 – 7th Grade Haumana meets Maiapilo.